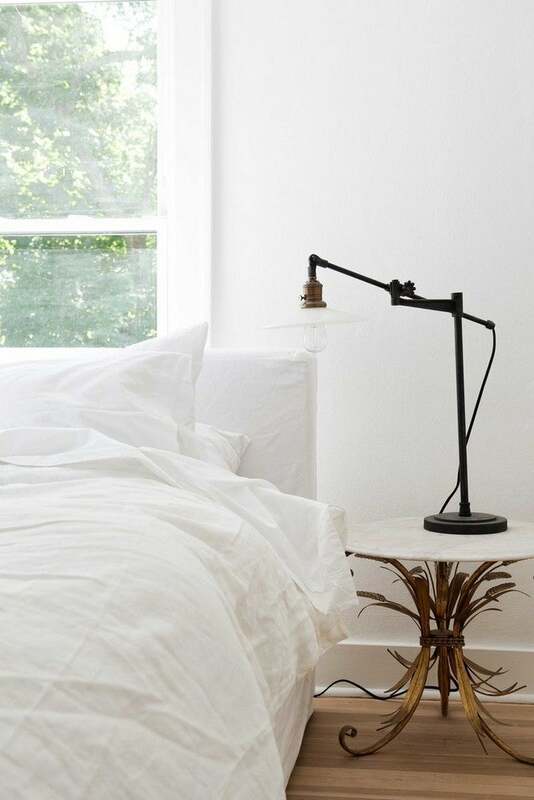 HGTV's Leanne Ford spills her go-to tricks for decorating with an all-white scheme. Decorating with an exclusively white palette may not always be as easy as it seems. Sure, we love a good whitewashed space with minimalism in mind, but more often than not, things can err on the more snoozy side. When done incorrectly, decorating with white can be more lackluster than serene, especially when the materials and furnishings happen to clash. We caught up with interior designer Leanne Ford – whose knack for decorating with a neutral palette is one to be rivaled with – to learn a little bit more about mastering the art of decorating with white. Here’s what she had to say! What is an essential component of decorating with white? The key to decorating with white is most importantly texture. An all-white room can be extremely stark and lonely, or it can be extremely warm and inviting, depending on the texture you choose. If you look at my spaces from afar, all you see is a white room, when you look at them closely, you see so many mixed textures: stucco, wood grain, matte walls, gloss walls, brick, marble, glass, clay, linen, cotton, etc. All of those textures are what make a white room feel inviting. Don’t under-estimate the beauty that comes from using shades of white. I love when dirty white, bright white, and creamy white all come together in a space. This can be in the form of the paint on the walls, or the furniture, linens, all of it. You always hear “Don’t be afraid of color” – I say, the opposite is just as true! Don’t be afraid of a “lack” of color. A neutral interior done well is anything but lacking! Neutral spaces and interiors allow your beautiful and thoughtful things to be appreciated and displayed. When choosing to go with a white room, remember that the sheen of the paint is everything. There is a time for the highest gloss and there is a time for a matte finish. (I personally am an extremist and don’t believe in the in-between!) If your walls are simple, nondescript walls, try the highest ultra gloss that you can get your hands on. This will give your walls a life of their own, and also offer an element of shine and reflection to the space. I love using a matte white on a textured wall, walls with wood or interesting trim. The mix of both of these finishes in one room feels great as well. If you live in a rental, you’ll likely have what I call “renters’ creme”, which may seem like white but is really dirty yellow creme. Paint those walls stat! But, keep the trims around doors, window, and floor in the renters’ creme, its faster, cheaper and easier, three things we all love. Adding the bright white actually makes the drab creme like a buttery warm hue.